Rotary 14 President Jennifer Brinkman has outlines her goals for the 2017-18 year. Building on the momentum of Mark Stephens year as President, she wants to strengthen our club's involvement with Everett Elementary and the surrounding neighborhood, to take us into the 21st Century by increasing our online presence and use of online resources, raise $60,000 for the many things our Foundation does and have a bunch of fun during the year. 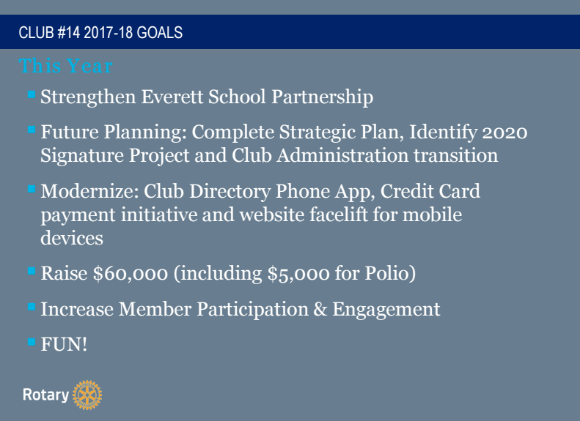 Goals for the 2017-18 year as outlined by Club President Jennifer Brinkman.